Since the attribute has been changed from "Teamwork required" to "Teamwork cache" at the full list of attributes and when hovering over the icon when creating the cache, I have noticed that it still reads as "teamwork required" when hovering over the Teamwork cache icon of a cache with that attribute. The hovering script needs fixed. The Find a cache 1.5 Help Center article has a Special attributes section that describes the "must haves." The Teamwork cache should be included as the Hide a cache 2.19 Help Center article states that "each teamwork cache must have a Teamwork Cache attibute." This specification should be added to the Find a cache 1.5 Special attributes list. 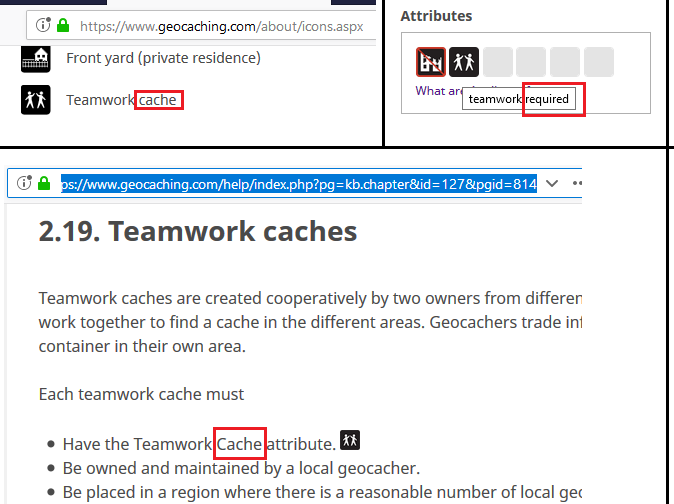 Since the attribute's name has changed from "Teamwork required" to "Teamwork cache," perhaps reviewers should be given instruction to not allow new caches to have the attribute if they are not a Teamwork cache as defined by Hide a cache 2.19. To allow them otherwise would imply the old meaning of Teamwork required rather than the cache being a Teamwork cache. Question -- Should an older Teamwork cache be allowed to be grandfathered, such as GC7DW25 that doesn't conform to the current Hide a cache 2.19 rules and allows one to post an online Found it log where a cacher doesn't find the final cache container or sign the physical log, but his/her partner in another state does (which would not conform for other reasons)? I've read several threads from the past month or so about this "Teamwork Cache" attribute and am still confused. 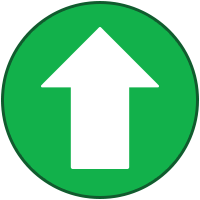 It sounds like some are saying that only caches that are "Teamwork" (aka "exchange") caches should be using the high-fiving people attribute that's currently named "Teamwork cache", but there are numerous caches that were previously published with the attribute when it was named "teamwork required". Would be great if GS could clarify whether the attribute is only supposed to be used on caches that meet the definition of "Teamwork Cache" or if the attribute just indicates that teamwork, or any type, is necessary. An example of the latter is a cache where multiple people are needed to retrieve the cache, even if it's not a multi-location "Teamwork Cache". Certainly, a multi-location "Teamwork Cache" should have an attribute that indicates teamwork is necessary to retrieve the cache. So, a "Teamwork Cache" as defined in Help Center article 2.19. Teamwork caches should certainly have the high-fiving teamwork attribute. But does that mean that other cachers requiring teamwork should not use the high-fiving teamwork attribute? It's unclear to me whether the high-fiving attribute is indicative of a cache 'type' or a cache 'condition'.